Barack Hussein Obama's socialist propaganda machine roared at full throttle last week, in defense of his "re-election campaign budget." Earlier Obama had greased the class warfare skids at the National Prayer Breakfast where he asserted that the wealth redistribution scheme outlined in his budget "coincides with Jesus's teaching that 'for unto whom much is given, much shall be required.'" Making sure he covered his bases, Obama added, "It mirrors the Islamic belief that those who've been blessed have an obligation to use those blessings to help others, or the Jewish doctrine of moderation and consideration for others." Of course, Obama's reference to Luke 12:18 was tantamount to what "TV preachers" do when prooftexting -- taking a piece of scripture out of context, reforming it to make a desired point, and thereby lining their pockets, or in Obama's case, lining his political fortunes. Fact is, the Bible places the burden of stewardship on the individual, while Obama and his Leftist cadres advocate that state-enforced redistribution of wealth based upon the doctrines of Karl Marx: "From each according to his abilities, to each according to his needs." Carrying that principle forward, Obama presented his "Winning the Future" (WTF) budget last Monday, claiming, it is "a reflection of shared responsibility. And some people go around; they say, 'Well, the president is engaging in class warfare.' That's not class warfare; that's common sense." No, all of the "fairness" and "shared responsibility" language is class warfare rhetoric. To that end, Obama's $3.8 trillion budget proposal demands tax increases of almost $2 trillion. It includes his "Buffet rule" 30 percent tax on incomes of more than $1 million, eliminating the alternative minimum tax, raising the highest tax bracket to almost 40 percent, raising capital gains taxes by more than 30 percent, taxing dividends as regular income, raising taxes on corporations and small business owners, targeting some financial occupations and banks for massive tax increases, burning down energy companies, refusing to extend the Bush-era tax cuts, and if he missed anyone in those groups, he's also proposing to raise the death tax from an outrageous 35 percent to a downright thievish 45 percent. Laughingly, Obama shamelessly condemned the last "decade of deficits" and had the audacity to claim, "My budget lays out a path for how we can pay down these debts." His proposal, even with huge tax increases attached, actually increases debt by another $6.7 trillion this decade. Of course, Democratic Socialists are not about to let such stubborn facts interfere with their WTF political agenda. For the rest of us, the facts are as follows: On the day Obama released his first bloated "New Era of Responsibility" budget (seriously, that's what he called it) in February 2009, the national debt was $10,881,159,722,000. When Obama released his current budget earlier this week, the national debt was $15,359,441,622,000. Now, if you don't have your nifty debt calculator handy, that is an increase of more than $4.47 trillion. That's right, Obama did not "cut the deficit in half" as he pledged in 2009. In fact, he increased the national debt, in just his first three years, more than all previous U.S. presidents from George Washington to Bush(41). Asked about Obama's broken budget pledge, his spokesman Jay Carney insisted, "It was a promise based on what we knew about the economy at the time. The economy turns out to have been far worse and in far greater distress ... than we knew at the time. The catastrophe was far worse than we knew." As for who knew what when, in 2008 Obama claimed, "I think everybody knows now that we are in the worst financial crisis since the Great Depression." 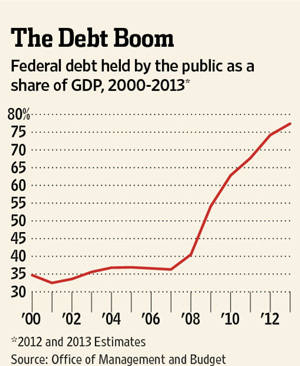 And if Carney thinks that "catastrophe" was bad, it will pale in comparison to the detonation of Obama's debt bomb. Unveiling his first budget, Obama protested, "Government has failed to fully confront the deep, systemic problems that year after year have only become a larger and larger drag on our economy. ... Policymakers in Washington have chosen temporary fixes over lasting solutions." Obama went on, "The time has come to usher in a new era -- a new era of responsibility in which we act not only to save and create new jobs, but also to lay a new foundation of growth upon which we can renew the promise of America. This budget is a first step in that journey. Our problems are rooted in past mistakes." Of course, Obama is the undisputed champion of "temporary fixes over lasting solutions." And, indeed, "Our problems are rooted in past mistakes," most notably catastrophic mistakes made by generations of Leftists and culminating, tragically, in the election of Obama. Obama's WTF budget deficit projection of $1.33 trillion is more than 8.5 percent of the entire nation's economic output, and in January, our total national debt exceeded economic output for the first time in history. Given his planned tax increases, Obama projects deficits will drop to about $900 billion in fiscal 2013, which would be the first time deficits have been under $1 trillion since his election. Even the most dim-witted students of economics know that as taxes increase, the economy contracts and, ultimately, tax revenues decrease, which in turn, produces even larger budget deficits. But Obama's minions, who clearly lack a keen sense of the obvious, vote on in blissful ignorance. Sure, the Obama administration's fudged figures have magically lowered unemployment below 9 percent, but, as the Financial Times notes, "According to government statistics, if the same number of people were seeking work today as in 2007, the jobless rate would be 11 percent." Besides, when you steal enough money from future generations and "invest" it today, predictably there may be some short-term economic improvement -- which is just what Obama needs for re-election. But the long-term consequences of Obama's economic policies will be devastating -- and Liberty will be the first casualty. So, do enough Republicans understand the stakes in the 2012 election? Will they reverse Liberty's slide into the socialist abyss? They can -- but will they? Republican House Budget Chairman Paul Ryan insisted, "[The 2012] election cannot be just a referendum on President Obama's failed leadership. Americans deserve a choice -- a choice between two dramatically different visions for our country's future. If we do not define the choice, then [Obama] will define it for us." More likely, the 2012 election will be a referendum on Republican leadership unless they renew their commitment to abide by their constitutional oaths, and, accordingly, make the case that the only path to restore our economy and ensure prosperity for all is to, first and foremost, restore the integrity of our Constitution. If the federal government collected taxes only for expenditures specifically authorized by our Constitution, our nation would not be on the verge of economic insolvency and dissolution. The only way to restore Rule of Law is if John Boehner and his fellow Republicans in the House and Senate will comport with their oaths. As Thomas Jefferson proclaimed, "The multiplication of public offices, increase of expense beyond income, growth and entailment of a public debt are indications soliciting the employment of the pruning knife." Jefferson understood the consequences of unbearable debt, and insisted, "We must make our election between economy and liberty, or profusion and servitude." Though the ranks of conservative Republicans are growing, many Beltway Republicans are still blinded by "Potomac Fever," and our challenge this year is to restore their vision for our country. We must make sure they see that the real election in 2012 is "between economy and liberty, or profusion and servitude."